For the last several years John's been knee deep in the DC Universe, not hanging around the edges of the superhero set, but one of them as a member of Justice League Dark. Captain Marvel and Wonder Woman show up as John's risky plan sparks a 'supernatural Black Death', but not to team up with him. Their appearance seems to be a case of John saying goodbye to all that, and I couldn't be happier. The low point of John's original 300+ run was his time in North America - his Britishness is a fundamental part of John's character, of his appeal, and if he's not based in bleedin' Blighty, surrounded by working class Brits and scabby demons, he's not being put to best use. 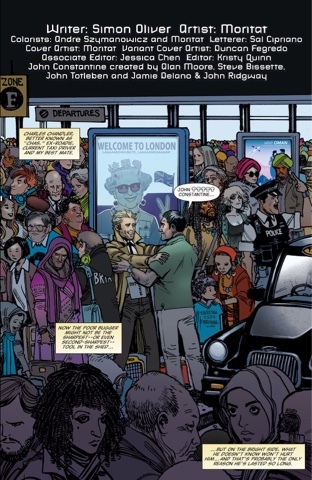 ...there's none of that here, as artist Moritat has John in his original look - white shirt, black tie, tan trenchcoat, a sardonic expression never far away. He does good demon too, but where he excels is in showing us the Britain of today, with the opening airport scene being outstanding. 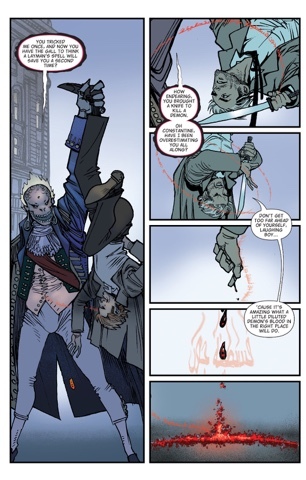 Moritat handles some of the colouring, with the top-billed Andre Szymanowicz, I assume, adding the bulk of the hues. The tones work well throughout, with the superhero costumes jarring, as they should. Sal Cipriano's letters are elegantly understated, suiting the story. Moritat's regular cover is a grabber, while the flashier variant by Duncan Fegredo is a wee smasher. This is a great package from Kristy Quinn and Jessica Chen, the editorial team behind such great DC Digital titles as Scooby-Doo Team-Up .... oh Lord, are you thinking what I'm thinking? I've enjoyed all DC Rebirth books so far, and been fascinated by how much or little they've changed. 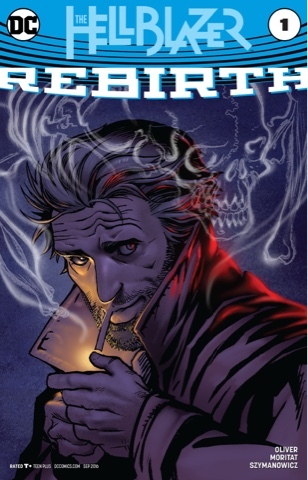 Hellblazer has had a massive retune and if you were a fan of pre-New 52 John, it's time to come back. 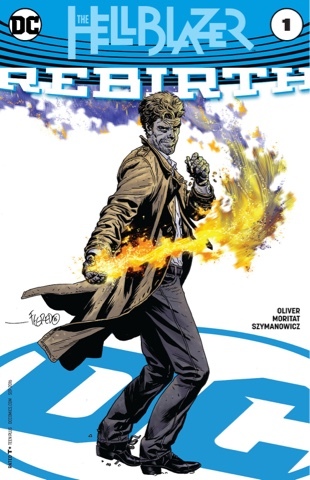 I have never read a Constantine book in my life though I do like the character. I like that TPTB have been more "open" about him being Bi in recent times, such as in "Bombshells." Or maybe they always have but I'm just seeing it more as I search more for queer representation in my favourite medium. I still can't get used to John as bi, mind, I could never get used to him being all over Zatanna. He shouldn't be allowed any nice things! It is weird that I can think of only one or two bi-characters in mainstream comics. Moondragon... does Cloud count? I thought Cloud was asexual. Of course, the "Women of Batman" are full of bi characters, (now) Catwoman, Harley, I'd say Poison Ivy, but I think she's considered pansexual. On the "Gotham" TV Series, Barbara Kean is bi, but that's not comics. I don't think Zee should be with him, but maybe that's because for so long he was on the fringes or separate from the main DC. Ohhh, one bi character is the original Icemaiden, who doesn't exist anymore. Oh, yeah, and Catman is bisexual now, and didn't Gail Simone intend to have Black Canary bi? I like exes. Exes are a great example of history interacting with the present, and that's what gives characters depth. Comics have too few of them, IMO, and even fewer when things get rebooted and rebirthed every few years. I'm good with them being exes, it was their constant teaming up in the New 52 Justice League Dark that was a bit much. I love your idea that John hooked up with Zee to get to Zatara. Gail Simone wanted a bi-Dinah, Uncle? I hadn't heard that one. I only read an issue or two of JLD, so I'm not familiar with all that. Been meaning to catch up with that book, but that's not a selling point for me. And Uncle's right: Gail's mentioned her intentions for Dinah on her Tumblr a few times. Never got into the books, though. I love John but haven't read him in a looooong time. I collected the first 150 issues of Hellblazer then dropped off. And then dabbled here and there but it never seemed to grab me like it did in its inception. And having him in a Justice League seems weird. As you say, John needs to be a UK character. (My fave runs are Delano's and Jenkins - both very British). So are you saying I should pick this up? Sounds like it! Give it a crack Anj. Or let me read a few more issues and I'll gives you a stronger recommendation either way!